Stephen McCullah needed to raise $26,700 by May 11 in order to secure enough funds through Kickstarter.com to, well, kickstart his expedition to the Republic of Congo to hunt a reported living dinosaur. When the deadline arrived, the 21-year-old adventurer and Missouri native had received pledges totaling nearly $29,000. He’s now packing his bags and a powerful tranquilizer rifle — to bring down a possible dinosaur during what he has dubbed the Newmac Expedition. 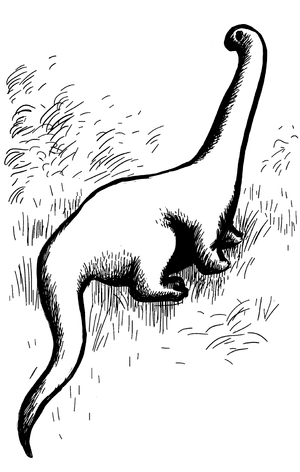 McCullah said that his team will end up at the southern tip of Lake Tele, where mokele-mbembe have been reported. The Newmac explorers will set up camp at the village of a pygmy tribe. For the remainder of their three-month stay, and as long as there are no health or safety issues intervening, the men will set out every day with a variety of special cameras, searching for new species, large or small, including canine-sized tarantulas. That they were funded through Kickstarter leaves me in doubt about the ethical nature of that organization… with the knowledge that KS takes 5% of the $26,700 for listing it. Making money on unintelligent people is much too easy in the U.S.A.
Posted on May 22, 2012, in animals, atheism, Education, ethics, Finance, funny, history, humor, Internet, Legal, News, Opinion, quote, Religion, Science, Word from Bill and tagged Dinosaur, Kickstarter, Lake Tele, Living dinosaur, McCullah, Missouri, Mokele-mbembe, Republic of Congo. Bookmark the permalink. 3 Comments. We already have “dinosaurs” living among us. They are called Alligators and Crockodials. And apparently birds as well. But Brontosaurus? Seriously, though — finding a living dinosaur would not disprove evolution, any more than finding a living coelacanth disproved it, so this little safari was pointless before it began. But creationists are gullible by definition, so it’s no surprise that they could be conned out of thirty large.